Marshall McLuhan, a famous pioneer of media theory, once called media the “extensions of man”. Now, at the time he wrote this there were no iPhones or tablets or smart boards, but regardless McLuhan was on to something. He meant that media extends the senses given to man so they can communicate with one another in ways and speeds that are, to put it bluntly, inhuman. As we have progressed from the emergence of writing to television, the internet, and now into “smart” technology, we find ourselves addicted to the media we use; each medium seems like a life line and at times we seem lost without them. So what happens when the mediums we have adopted into our daily lives collide with education. Do they repel or slowly integrate? Today, we are seeing more and more integration of media in the classroom as organization and learning applications emerge to help students and teachers interpret the world around them in more ways than ever. While this media integration is a newer process and we still don’t know how the long term use will effect users, it’s important to embrace the change as an “and” rather than an “instead” to the traditional educational style, which many associate with solely lectures, readings, and writings. One of the biggest promoters of using technology in classrooms are colleges and universities where most students have access to a computer or laptop and are encouraged to use various applications to increase their learning experience. At the University of Virginia, I have been exposed to various applications that have both organized and altered the way that I view learning- all for the better. The first application I began using was Dropbox. Dropbox is an online application that acts as a cloud of information, allowing you to upload and store files, pictures, etc. all in one account. Many of my professors began using Dropbox widgets on their class websites for us to turn in assignments and papers, which not only organized our submissions, time stamps and all, but also allowed for the professor to grade each assignment online and return them to us without any physical transfer of papers. Another application I began using was Evernote. Writing notes is an essential part of learning anything and while sometimes graphs and charts need to be handwritten, I learned that many lectures I sat through would better be noted and absorbed later if I typed them out. I began using Microsoft Word to write my notes and quickly learned what a rookie mistake I had made when I came back from class one day and noticed my Microsoft had crashed and all my files were corrupted. This is the time where you ask where I backed it up. As you can suspect, I didn’t, so once I lamented my hardship to a professor, they recommended Evernote. Evernote not only backs up everything to your account online when connected to the internet, but also has many features such as text recognition, file attachment, presentation modes, and screen captures that all increase the way you can learn and understand the content in front of you. As quizzes and tests began to pile up, I realized just reading my notes over and over again was not going to be enough to get me that stellar grade. Being a college student, I also didn’t want to waste paper and write flashcards, only to wonder if I had lost one in the process of transferring them from classroom to dorm to gym. Quizlet became my new best friend. Not only was it a way for me to quickly make and review flashcards, but it also gave me the ability to search for sets that people had already made for my class. I was able to share my flashcards with other students and create study groups that really encouraged students to be both interactive and collaborative in the learning process. While Dropbox, Evernote, and Quizlet all help my life as a student outside of the classroom, Yopine is an app that can be used by both teachers and students in the classroom. With Yopine, audience response is made incredibly simple. The professor or leader can stage questions via the *edu web dashboard or create questions, polls and brainstorms on the fly where the audience can instantly respond and give feedback. Picture a professor quizzing studentes on topics in the time running up to a quiz and having the ability to see, in realtime, the questions that received low amounts of accurate responses would signify that they relate to a concept that needs further explaining. I wish I had something like this when I was too scared to raise my hand saying I didn’t understand a lesson because this way it allows users to be honest and anonymous with their responses. Technology in the classroom is something to which we should look forward . No, I don’t think only textbooks online and online classes can replace the future of education. Remember, we are extending the senses of man, not replacing them. Hyper-local Polling with "People Around Me"
1) Educational Response System: In university lecture classes, professors ask questions to measure students’ grasp of the material. Rather than relying upon an unspecific “show of hands” or expensive audience response hardware (e.g., iClicker), professors use People Around Me to direct polls or brainstorms just to students in the lecture hall. Professors will have the capability to prepare several questions before class and stage them throughout the lecture period. 2) Targeted Opinion Polling: Users can use People Around Me when they need to collect information from a targeted group of people. For example, if you are on a plane to New York City, it is likely that a significant number of your fellow passengers are from NYC and familiar with the area. Thus, if you are wondering where to grab dinner when you arrive, you can post a brainstorm just for the passengers of your flight to provide suggestions. Similarly, if you are at a tech conference such as the recent Apple WWDC, you can target a poll or brainstorm toward only the tech experts and enthusiasts in attendance. 3) Raffles and Contests: Many events include raffles and contests as a way to distribute fun prizes and promotional items to attendees. Yopine’s People Around Me function serves as a means to fairly and simply administer these contests and raffles. A brainstorm can be shared via People Around Me with event attendees only, with each response representing one’s entry into the raffle. This method also guarantees that external parties are unable to enter the contest remotely. Event organizers can “kill two birds with one stone” by taking advantage of the brainstorm raffle format to collect feedback from the event. A raffle brainstorm that asks, “How would you improve this event for next year?” uses the prize to incentivize participants to contribute ideas. 4) Social interaction: People Around Me also contributes greatly to the user’s social experience on Yopine. A user at a bar could ask, “What’s the best cocktail to order here?” and view responses from the other people at the bar. If the user is interested in pursuing a conversation with responders, he can easily find them in the vicinity. In future versions of Yopine he will also be able to start a personal conversation with other users within the Yopine app, by dragging his avatar over to the avatar of another user on the screen. Photo capabilities will allow you to take a picture, choose from your existing gallery, or find one from the web to accompany your poll or brainstorm. The new version will also include photo-filtering options for you to transform your pictures. Not sure which dress you should wear to that wedding this weekend or which tie is more appropriate for your upcoming presentation? Snap a quick picture, add a cool filter, and send it to your friends or the Yopine community to help you decide! Sometimes you need to gather a lot of input without simply asking the public, but sending similar polls to the same groups of people can be tedious. Yopine is intended to be a quick and fun way to gather opinions, so you can look forward to grouping capabilities in the next versions. You can plan the next reunion by calling a poll to your “Family” group and get ideas about next semester’s classes or work advice from your “PSYC101” or “Coworkers” groups by calling a brainstorm. Now you can easily communicate with the same groups of frequently contacted people at once without having to individually select them from a lengthy list. Along the same lines, the current contact selection process will be redesigned. By allowing users to integrate with popular social media platforms like Facebook and Twitter, getting ideas from your online friends becomes even easier! This creates an outlet of interaction outside of your phone’s contacts list. Post questions directly from the app to your newsfeeds for your friends and followers to participate in. Have something on your mind you want to share about the poll, the brainstorm, or others’ responses? The commenting feature will let you give input in more ways that one. The LA Times recently put out a list of “feedback” apps to look to help with decision-making. In our opinion, Yopine would become an excellent addition to the group as it matures. While some apps offer the classic “hot or not” or the option to rate, Yopine does not. Many of these apps depend on the use of images as an integral aspect of the user experience. And even though Yopine foresees photo capabilities in upcoming versions, not every social media tool should rely on pretty pictures. 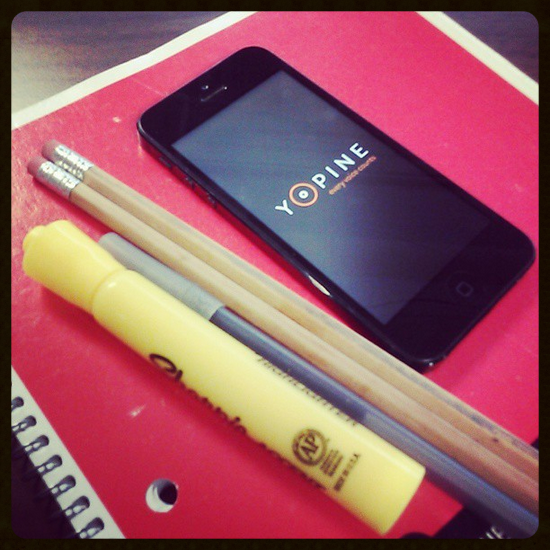 Yopine exists to generate meaningful data that result in real world decisions and actions. In addition to garnering feedback from the general public, the app also enables yopiners to use it hyper-locally by gauging the opinions their personal circle of friends for more influential opinions. Yopine’s best feature is, perhaps, its universality in regard to its responders. Although some apps can share polls via their websites, some decisions need to be made quickly, effortlessly, and while on the go. With Yopine, users can send out polls and brainstorms to close networks regardless of whether or not those contacts have the app and regardless of their smartphone operating system, a downfall and inconvenience of many other feedback apps. A new phone or just plain boredom commonly lead iPhone users to browse the Apple App Store for the next addictive, fun, or useful app. And because of the frequency of visits, it’s a pretty big deal for app companies and developers to grab a spot as a top downloaded app. Even being in the top 50 is a pretty significant bone to catch, but getting there is no easy task. TechCrunch rounded up all the top apps in May 2013 and gave us the run down. To reach the top 10 free positions, apps had to see over 70,000 downloads and $47,000 revenue per day. Top 50 free apps saw figures around 20,000 and $10,000, respectively. But how do these ranks affect the overall app marketplace? The discovery and use of new apps becomes more difficult as the most popular ones are easily presented to and trusted by users. Moreover, the focus on the number of downloads may encourage developers to work towards that instead of consistent app growth. What is an app if it is downloaded by millions and then deleted later on while its better-conceptualized competitors struggle to gain visibility in the app store? On July 8, 2013, Facebook went public with its newest innovation, Graph Search. To put it simply, Graph Search is to Facebook as Google is to the World Wide Web. With the feature, users can type queries into the site’s search bar and find very specific ways to filter through Facebook users and their actions. The difference, according to Mark Zuckerberg, is that Google and other search engines suggest sources from which to look for answers whereas Graph Search provides answers. Despite these fairly respectable motives, Facebook users have been more interested by the numerous awkward searches that can be made with the feature. And yes, they all yield results. While it is true that Graph Search will force users to become more aware of their privacy settings and more cautious of their actions online, there could also be unintended reactions. It may, instead, prompt Facebook users to become more paranoid, more likely to lie, and more hesitant to integrate social media into their lives. Who knows, next we might see features that reveal who has been on your page and for how long or a tool that allows you to search for your name among comments and private messages. But that will probably be advertised as a useful marketing tool for businesses. Gary Mendel co-founder of Yopine sat down for a few minutes of off the cuff discussion with the famous Kwasi to riff on Yopine past, present and future.